A good stock always remains a good buy. The fast growing phase of the business Ezion has been operating is indeed a very compelling investment story. Since last year, its management has shown good urgency and quality in making decisions to steer the company forward after a sharp decline in its stock prices between Aug - Oct. And it seems that this has been well executed over into the new year. Outlook - Buy. OCBC research too has a good coverage report on Ezion following its 2Q earnings report. Fair value estimate is $1.20 which represents some further 16% upside from current prices. Technically, Ezion holdings has broken the $1.025 resistance with high volumes traded on Friday following OCBC research maintaining a Buy call and its favourable earnings report. MACD (weekly) - MACD trending upwards with increasing positive divergence. 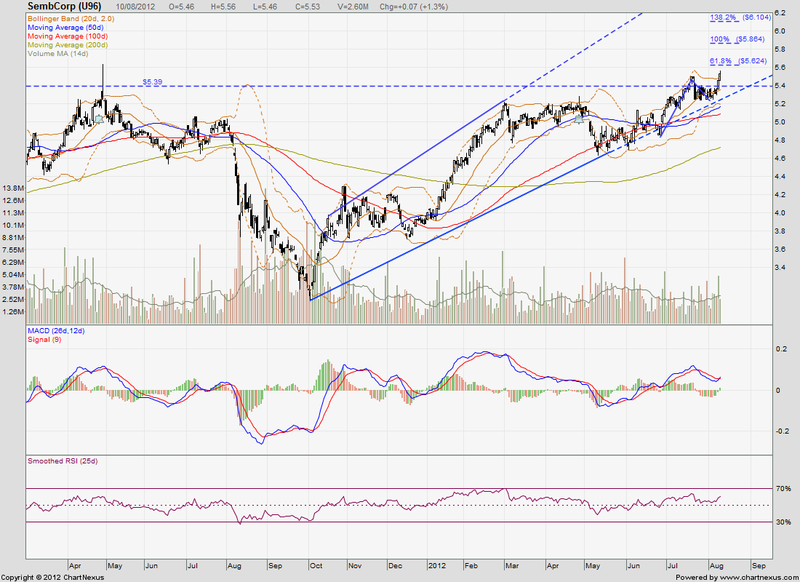 RSI (25w) - RSI trending towards 70% but not at extremely overbought regions yet. Bollinger Bands - Bollinger bands are widening and prices are headed towards the upper bollinger band with room to maneuver. 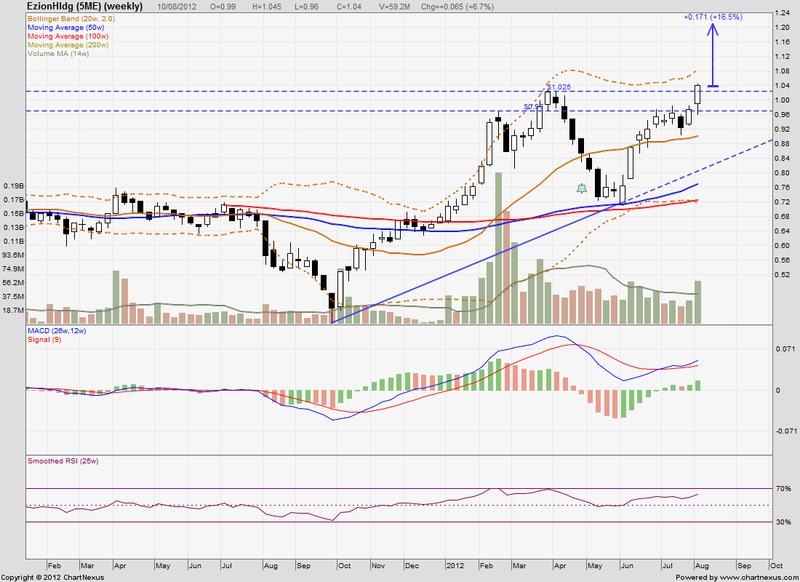 Volume - High volume on 10 Aug with a large white candlestick bodes well technically for further demand increase. SembCorp is a government-linked company with strong utilities and marine expertise. It recently announced a good performance in its 2Q earnings report with an increase net profit of S$190million compared to 175 a year ago. Order book stands at $6.6billion where half of which has been procured in this year. Its share prices were given a further adrenaline boost, crossing a critical resistance level, after its Marine subsidiary Sembcorp Marine announced that it secured contracts worth US$4billion from Brazil. Outlook - Buy. Knocking on the door of $5.40 and overcoming it presents a great psychological triumph for the demand and supply forces in the stock market. Technically, this break gives good upside to Sembcorp stock prices and further good news coming out of the Oil & Gas sector lately just bodes well for this GLC to reach new heights. 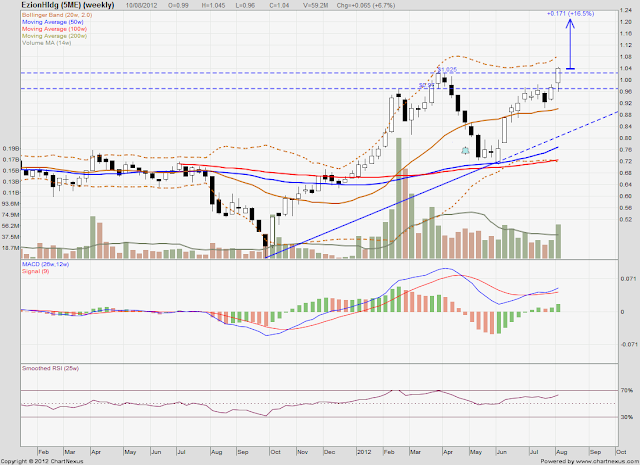 MACD - MACD trending upwards with positive divergence. RSI (25d) - RSI trending towards 70% with room to go. Bollinger Bands - Bollinger bands are widening and prices are riding the upper bollinger band already. Possible further volatility to ensue. Volume - No presence of any spectacular change in volumes traded but some slight increase in average volumes traded over the last 14 days.